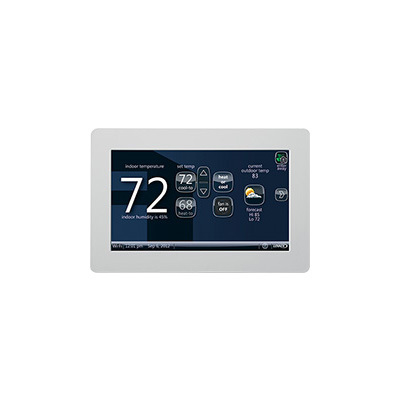 The Nuvango™ skin option and matching screensaver allow you to cover and protect the thermostat interface with any design or pattern you prefer. You can also choose a color to blend in with your dÃ©cor or the thermostat screensaver. iHarmony® zoning system compatible to eliminate hot and cold spots in the house. Programming fan option gives you the choice of continuous or intermittent air. Automatic control of whole-house humidity systems, based on programmed setpoints, enhances the comfort and quality of your air. Optimizes performance when installed with a premium Lennox® system. Precise Comfort Plus holds a temperature to within 0.5 degrees or less, when paired with a Lennox modulating furnace. Maintain constant communication with Lennox® premim equipment for a higher level of comfort control and system performance. Optimizes performance when installed with a premium Lennox system. Quality you can trust with reliable, time-tested components. Wi-Fi capability allows you to adjust temperature from your smartphone, tablet or laptop to save you from the costs of sudden changes in plans or weather. Multiple programming options for a single day or an entire week put you in control of your comfort and energy costs. Automatic changeover between heating and cooling, as well as humidification and dehumidification, helps control energy costs. Temporary and vacation hold settings allow you to set a constant energy-savings temperature at the touch of a button.